Natural gas recently broke below the floor of its descending channel on the 1-hour time frame to signal that a steeper slide is due. Price also seems to be forming a bearish flag pattern to signal continuation. The 100 SMA is below the longer-term 200 SMA to indicate that the path of least resistance is to the downside. In other words, the selloff is more likely to gain traction than to reverse. Still, price might be in for a pullback after this big move as oscillators are indicating oversold conditions. RSI is starting to pull up from the oversold level to signal a potential return in bullish pressure. 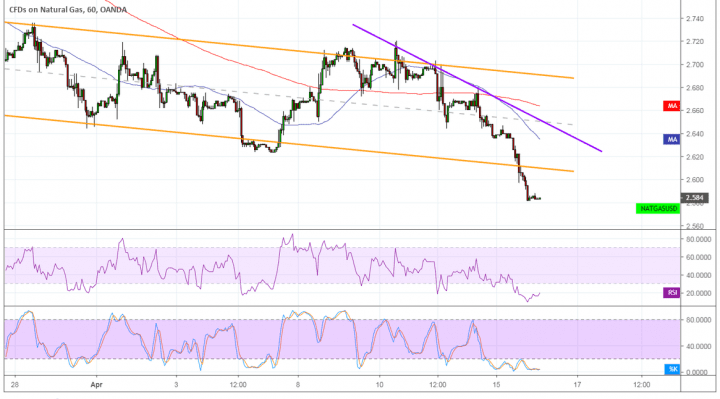 This could be enough to take price back up to the broken channel bottom at the $2.600 area or the newly-forming descending trend line from the previous week. This is also near the mid-channel area of interest and spanned by the moving averages’ dynamic inflection points. Stochastic has been indicating oversold conditions for quite some time but has yet to show any upside move. This indicates that sellers are exhausted but that buyers are not too eager to jump in either. With that, a break below the current consolidation at $2.585 could spur a drop that’s the same size as the earlier one. Natural gas suffered another leg lower on account of warmer weather forecasts in the weeks ahead, representing a shift from earlier estimates. This could mean much lower demand for the heating commodity even as suppliers ramped up output in anticipation for higher demand. With that, this could leave an oversupply hanging over the next couple of weeks, putting more downside pressure on prices. It doesn’t help that risk aversion in the markets is weighing on business outlook and prices of riskier assets like commodities.